Tonight the Music Box in Chicago kicks off its first ever, two-week long festival of 70mm films. 70mm is a wide-gage, high resolution format. It is bright and sharp and absolutely steady, free of the distortion that can occur with 35mm films. The format&apos;s no novelty: It&apos;s been around about as long as we&apos;ve had movies. But it is costly, requiring special projectors and screens. So 70mm has always been more of a special treat than standard fare at the cineplex. Still, the Music Box program is eclectic enough to satisfy a variety of cinematic tastes. High art formalists will appreciate 2001: A Space Odyssey or Vertigo, both of which screen tonight. Early Gen Xers can wax nostalgic over (and bring their kids to) Chitty Chitty Bang Bang. And for cult film enthusiasts, there&apos;s Lifeforce. The sci-fi thriller about space vampires was a failed attempt at a blockbuster, directed by Tobe Hooper and shot by the late Alan Hume, who did great work on films ranging from Return of the Jedi to one of my personal favorites, The Legend of Hell House. Doug McLaren, head projectionist at the Music Box, says the festival was inspired by an advanced screening late last summer of Paul Thomas Anderson&apos;s film The Master, a rare contemporary film shot in 70mm. It turns out the Music Box is the only theatre in Chicago capable of projecting 70mm. After a lot of local interest (and calls from "Anderson&apos;s people", according to McLaren), he arranged the screening, which almost immediately sold out and prompted rave reviews, for both the film and its presentation. The Music Box only got their 70mm projector about 10 years ago – McLaren says to expand both their programming scope and projecting capabilities (the theatre can screen 16, 35, and 70mm film, as well as the digital equivalents to film: DCP or "Digital Cinema Package" and HDCAM). But McLaren says in preparation for the festival they&apos;ve completely rebuilt their 70mm projector, installing brand new gears and bulbs, and re-timing "everything." Paradoxically, at the same time that the Music Box has been investing time and money in an aging and almost obsolete format, what they&apos;re now screening is almost entirely digital content. McLaren says that wasn&apos;t the case even as recently as six months ago. But starting with their latest winter calender, the tides shifted. "Even things that used to be a new restoration of a given film is now video," he said. "Which was quite a shock, because it came faster that we thought. It seems like everyone decided to go all in at the same time." Much has been written about the rapid shift from analog to digital at the movies, in particular how the new "paradigm" threatens small, independent film exhibitors and movie houses, who can&apos;t always afford to pay for new digital equipment. But I hadn&apos;t yet fully processed the impact this was having on the people who actually climb into the booth and screen the movies for us, until a recent chat with another local projectionist (and full disclosure, good friend), who had just returned from her annual 3-week gig at the Sundance Film Festival in Park City, Utah. Michelle Puetz has been a freelance projectionist for 15 years. She regularly travels to festivals in the U-S and abroad to inspect and project films. It&apos;s always been a high pressure and even grueling gig. But thanks to digital, Puetz says the projectionists at Sundance saw their workload double. Puetz and her colleagues had to inspect almost 300 movies, most of which were either DCP or HDCAM. Only 16 were 35mm films, and of those a mere 5 were actually screened. The other 11 were back-up copies, which were run through projectors with their lamps not on, in case something went wrong with the digital copy. The protocol for inspecting actual films is pretty clear cut. But for what Puetz dubs "the wild west" of digital content, the Sundance projectionists had to figure out a whole new standard of inspection and quality control. DCP, unlike a reel of film, is just a hard drive full of files which program a number of things, from the actual image, to the soundtrack, to the language or even font of the subtitles. A separate key (an alphanumeric string) "unlocks" the content, specifying which servers and for what period of time, down to the very minute, it can be played. Which means that instead of measuring the length of a film or checking it for tears or splices, Puetz says "you&apos;re an IT person learning how to read code." And because there&apos;s no actual "object" to inspect often the only way Puetz could check a film was to load it on a server and play it, in real time. Even that wouldn&apos;t guarantee a trouble-free screening (hence the 35mm back-ups). Digital promises that you can just push play and walk away. But any number of things can go wrong (see David Bordwell&apos;s exhaustive but enlightening take on the potential pitfalls of the nascent format). And if it does, a film technician can&apos;t open up the projector and take a look. They have to call someone who is authorized to access and re-format the content (controls Puetz and others chalk up to the studios&apos; "paranoia" about piracy). The process sounds annoying and mystifying to be sure. But according to projectionists, it&apos;s also diminishing. "In the past projectionists, though technicians, were very deeply interested in the art of presentation," Puetz said. "They knew when an image looked right on screen. They could see a shutter vibration or flicker. They could actually hear it going wrong. Now with digital, the presentation standards are set by studios. So it&apos;s not really an art anymore." McLaren of the Music Box concurs. "It invites a laziness I don&apos;t appreciate," McLaren said. "There&apos;s nothing I can really change." And while he&apos;s a big proponent of "showing things in the medium that they were intended for, digital is creating an atrophying of skills, both in myself and my staff." That&apos;s likely not just because of digital. Whether because of cost-cuts or sheer indifference, 35mm projection at many multiplexes has for years now been foiled by under-trained staff and poorly maintained equipment: How many badly lit, awful sounding films have you sat through? These days, if audiences do notice the difference between film and digital, it&apos;s probably because if only by comparison, the latter is often a more satisfying experience. Even Puetz says if she&apos;s going to see a Hollywood feature she wants it be digital. And the digital &apos;adapt or die&apos; scenario projectionists face is not unique. Other skilled practitioners, from car mechanics to doctors (who seem to spend as much or more time doing data entry as diagnostics during appointments), have moved on. In fact some projectionists are excited by the potential of digital (Mclaren notes there&apos;s currently room for up to 128 audio tracks on DCP). Still, what exactly is that potential? So far the main argument seems to be that digital conversion saves money, for the studios anyway. Great for them. What about us? I don&apos;t mean this to be a Luddite&apos;s lament. Smart phones, computers, social media streams: All have allowed us to communicate in wonderfully transformative and complicated ways. How much wonder and imagination has digital conversion thus far brought to actual movie going, or to the art of film presentation? Digital visual effects have produced fantastic spectacles. But for all its technical innovation, film going and film screening has been a relatively stable and standardized experience. And so it more or less remains, at least for those of us out front, in the house seats. Not so much for those up in the booth. As the art of projection dies away, and actual films become as rare and precious as old master paintings (how ever did the copy become the master, the original? ), it is hard not to wonder to what purpose - or even why - such a complete and seismic shift in the film experience, had to happen. Maybe it&apos;s too soon to tell. But as the winding down of cinema speeds up, I&apos;d really love an answer. 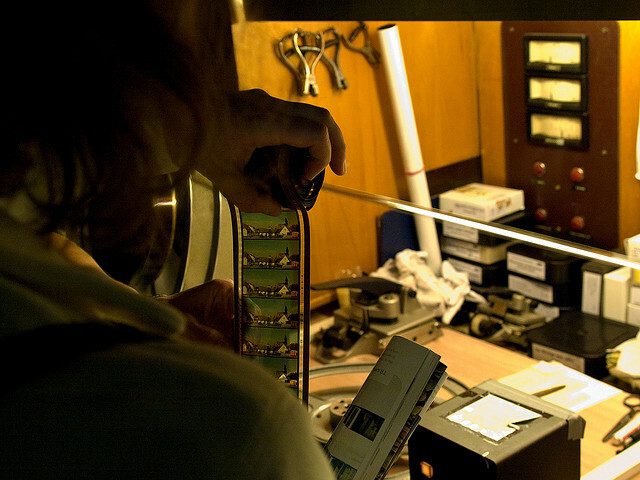 The 70mm Festival runs February 15-28 at the Music Box Theatre. You can follow me on Twitter @wbezacuddy or Facebook.